I have recently taken up a new post and was fortunate enough(?) to attend a meeting around the financial governance of a major project of which my employers are a partner, along with several other organisations (companies & universities). My predecessor had given me a couple of introductory sessions on the budgeting and claims processes that were in place, but, as the new boy in this meeting I was expecting to be a little naive and not ‘up to speed’. However, it would seem that I was not the only one! As the meeting progressed it became clear that many of the other attendees, many of whom had been involved in the project from initiation, still found much of the governance as confusing as I. The rules & regulations, the lack of definite statements and guidelines seemed to be adding so much confusion and complexity to the whole process, why? What would be wrong with some simplicity? As I have suggested above the complexity of the governance and processes I have witnessed on this project lead to confusion, waste, rework, delays… the list goes on. This all wastes time and money, threatens the quality of delivery. 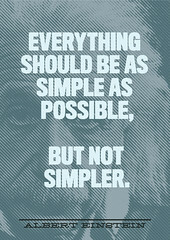 If simplicity was focussed on, the project should proceed more quickly and to a lower cost; there would be less need for checking, correction etc., all of which would be beneficial to all involved. Simplicity is also something I would like to see more of from websites, call centres etc. This week I wanted to contact a couple of service providers, off I went to their websites… After what seemed like ages looking for a contact number I found one for each, even though I had gone to their contact us pages. I then set about ringing one, to get to speak to the department I wanted I had to go through atleast 4 menu selections, to be told to ring another number and then go through another 5 or 6 menus. Is it just a ploy to put people off? This is my time and my money being frittered away! K.I.S.S focuses on making a product or service as simple as it can be but still maintaining fitness for purpose; whether that be a machine, a website or a presentation. Having witnessed this meeting and knowing that I have to pick this project I am certainly hoping that the K.I.S.S principle can be applied and we can get more simplicity into these processes. This entry was posted by Rob Cameron on October 23, 2010 at 2:45 am, and is filed under miscellaneous. Follow any responses to this post through RSS 2.0. You can leave a response or trackback from your own site.